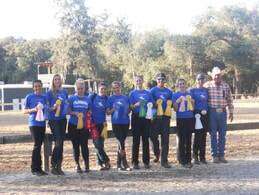 The UF Equestrian Club is for individuals enthusiastic about or interested in horses! Please select from the drop down menu beneath "Club" for Merchandise and Club Forms. To remain an active member, you must complete the following requirements per semester based on your current membership within the University of Florida Equestrian Club. ​Active membership is required to participate in voting, to run for office for the following year, to show with any of the University of Florida Riding Teams, or to participate in club events. General Club Members are members who do not hold office (not including chair positions) and do not intend on competing with a team. Team Members are riders that plan on attending shows with any/all of the IHSA/IDA Teams within the University of Florida Equestrian Club. Officers are members that were voted into position the previous year or as needed. All active members cannot miss more than 2 consecutive meetings without approved excuse. Retirement Home for Horses at Mill Creek Farm is a nonprofit equine sanctuary located in Alachua, Florida. They provide lifelong care for horses that have been neglected or abused or that are unwanted and destined for slaughter and we volunteer there to feed and groom the horses. Two Tails Ranch is one of North American's premier exotic animal care facilities. 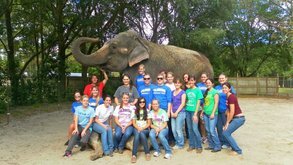 Located just west of Gainesville and Ocala, Florida, this spectacular haven has been a training, medical, breeding and retirement facility for hundreds of elephants and exotic felines for over 20 years. We volunteer to help ensure food for the elephants. We have a few nights per semester where the team receives a percentage of the money spent on food at local restaurants. These include: Chick-fil-a, Moe's, Sweet Dreams, Applebee's, Chili's, etc. Each team (Hunt Seat, Western, and Dressage) usually hosts a show over a weekend each year. These are fun, but require a lot of hard work as well as the help from the club and all three teams to handle horses and manage the show. We usually do one food drive per semester to help local non-profits in the Gainesville and Alachua area. We often help the Food for the Mighty and Gainesville Backpack Club. At the beginning of Fall, we usually have a tie-dying meeting where we can dye our Equestrian Team shirts! It's a lot of fun! Once the weather gets chilly in Gainesville, we have a bonfire night at one of the coaches' barns to roast marshmallows and just hang out.